Imagine Having a spectator literally think of any word, any number, any design, or any thought. 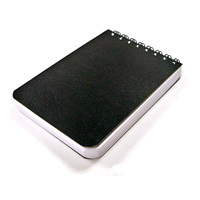 The thought is written on an innocent pad. Now, thanks to the Telethought Pad you instantly know their thought. You and the spectator are looking at the gimmick at the same time, but they never know it. All of the volunteer's information is delivered ingeniously, imperceptibly, and effortlessly to the performer. Any book test, any design duplication, any add-a-number routine, any mental experiment- all are devilishly simple with this extraordinarily clever yet subtle new gimmick. The best part is, you don't even have to touch the pad to get all of the information!!! 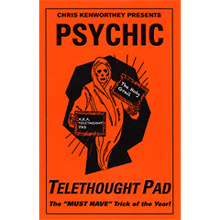 • To see a "Telethought Pad" is to want a "Telethought Pad"